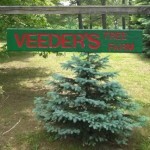 Veeder’s Tree Farm is a family owned and operated Christmas tree farm located in Earlton, NY. They started planting in 1983 and has grown into 20 acres containing approximately 20,000 beautiful hand sheared evergreens. Featuring choose & cut Christmas trees.